The closest airport to Yangshuo is in Guilin, which is about 70 kilometers away. The Guilin Liangjiang International Airport mainly hosts domestic flights; it does however offer international flights to other Asian countries such as Indonesia, Thailand, Japan and South Korea. For a few years now you can also take advantage of the 72 hour visa exemption here. Note that the airport is located about 28 kilometers to the southeast of the center of Guilin. There are buses that leave every hour from the North bus station in Yangshuo, right by West Street, and arrive at the South bus station in Guilin, which is found in the center. The ticket costs 22 Yuan and the trip takes about an hour and 45 minutes. To get to the airport from here, you should take bus number 100 (the stop is located across the street from the station exit) up to the north train station in Guilin. The ticket costs 1 Yuan and the trip takes about an hour. Once at the train station, you can finally take a shuttle to the airport. There’s also a shuttle that directly connects the Yangshuo north station and the Guilin airport. There are 8 shuttles a day, which depart at the following times: 8:00 a.m.; 10:00 a.m.; 12:00 p.m.; 1:30 p.m.; 3:30 p.m.; 5:30 p.m.; 7:30 p.m.; 8:30 p.m.
For the reverse trip (from the Guilin airport to the Yangshuo north station), the shuttles depart at the following times: 9:30 a.m.; 11:30 a.m.; 1:30 p.m.; 3:30 p.m.; 5:00 p.m.; 6:30 p.m.; 8:00 p.m.; 10:30 p.m.. The cost of a ticket is 50 Yuan (one way) and the trip takes about an hour. If you prefer to take a taxi directly for the airport, the price is about 300-350 Yuan. Beginning on March 1, 2016 Yangshuo station has been in operation. Actually it’s located in Xingping, some 30 kilometers away, but the stop is called “Yangshuo”. The station is served by high speed trains on the Guilin-Guangzhou line, from which you can reach all cities in China served by the rail network. You can get to Guilin Station North in about 20 minutes and Guangzhou Station South in about 2 hours and 30 minutes. The connection between the station and city is guaranteed by a bus line (which departs from the South Station of Yangshuo and also stops at Fuli Town). The cost of a ticket is 20 Yuan and the trip takes about an hour. 6:30 a.m.; 7:20 a.m.; 9:20 a.m.; 11:00 a.m.; 11:20 a.m.; 12:30 p.m.; 1:00 p.m.; 1:40 p.m.; 4:00 p.m.; 4:30 p.m.; 5:20 p.m.; 5:50 p.m.; 8:00 p.m..
8:30 a.m.; 9:20 a.m.; 11:30 a.m.: 12:50 p.m.; 1:10 p.m.; 2:20 p.m.; 2:50 p.m.; 3:30 p.m.; 5:50 p.m.; 6:30 p.m.; 7:10 p.m., 7:40 p.m., 9:00 p.m.; 9:20 p.m.; 9:50 p.m..
Click here to read our guide for traveling by train in China (and to learn how to buy a train ticket online). In Yangshuo there are two bus stations: the North Station and the South Station. There are also a few urban bus lines that connect the two extremities of the city. With Line 5 you can cover for just 1 Yuan the entire route from the North Station to the other side of the city. Walking will take about an hour. It is from here that buses leave for Guilin, including the bus for the airport. Getting to the Guilin South Bus Station (located about 15 minutes on foot from the city’s central square) takes about 1 hour and a half – 2 two hours, depending on road conditions (which is a constant construction site). The cost is 22 Yuan. Departures are frequent, so you could show up at the station anytime and find a bus leaving within 20-30 minutes tops. The bus is also useful for those who want to visit towns between Yangshuo and Guilin, since the bus makes various stops. From this station all short range buses connecting nearby towns depart, such as Xingping for example, where you’ll find the train station, and Gongchen. The are many reachable destinations from both stations. To search by destination, you can use this website. Yangshuo has a subtropical climate. Aside from a few exceptions, which according to older locals are becoming more frequent, winters aren’t too cold and relatively dry, with maximum low temperatures getting down to 4-5 degrees Centigrade, at night. When there’s sun, winter days are mild (20-25 degrees), while if the sky is overcast the temperature stays low all day long, with a temperature range close to zero. Summers, on the contrary, are hot and humid, with temperatures beginning in June through all of September staying stable between 33 and 39 degrees. The passage from summer to winter, and vice versa, is gradual. The months of October/November and April/May are characterized by pleasant temperatures (15-25 degrees) and restrained humidity, despite frequent rains. Most of the precipitation is concentrated in the months of April, May and the beginning of June, with torrential long-lasting rains (at times even lasting for a few days) that, not infrequently, produce flooding in ares of the city near the two rivers that cross it. In the summer months up until September there are brief torrential rains, with intervals of sun, that can repeat several times in the course of the day. Its distance from the sea keeps it safe from typhoons. Yangshuo is a town of about two hundred thousand inhabitants that extends in a north-south direction for no more than five kilometers and east-west for about four kilometers. Considering its limited dimensions and mild climate, the most used form of transport is without a doubt the bicycle, also because the city doesn’t present any noteworthy gradients. This makes the choice of where to stay not as important from a logistical point of view. What you should take more into account is the amount of noise at night. If you prefer to sleep in peace, I recommend that you avoid staying in the center around West Street or in the neighborhoods near the two main roads that cut across the city. Close by to the city, but already fully into the country, some 3 to 4 kilometers from the center you can actually find high-quality lodging in one of the nearby villages, such as Tian Jia He or Jima, to enjoy the peace of the country though remaining in the immediate vicinity of the center. The purely touristic vocation of the city makes it rich with services, from entertainment to clubs that are impossible to find in other Chinese cities of the same size. This makes Yangshuo a very attractive place, which hosts innumerable foreigners of long to even longer term stays, and a great place to have both action and peace and tranquillity. There are no university-level educational buildings, and even among high and middle schools there are no international schools but only purely Chinese institutions. Even from a health point of view there are no international-level clinics, but just one Chinese public hospital (for more information see the specific portion in this same article). For these structures (universities and international clinics) you’ll have to go to Guilin which, as was mentioned, is about an hour and a half away, distant about 70 kilometers. The breathtaking panoramas that surround the city and which have become a UNESCO World Heritage Site merit a visit of their own and could fill at least a week of touring by bicycle, without the need for a specific destination. Besides the natural beauty there are also other sites of interest to tourists fully described in all tourist guides on China. The following list with brief descriptions explain the most visited places in the city and its surroundings as a starting point for those wanting to explore more deeply. This is the central road of the city where there’s a concentrated quantity of hotels, restaurants, shops and night clubs. West Street represents the beating heart of the action. 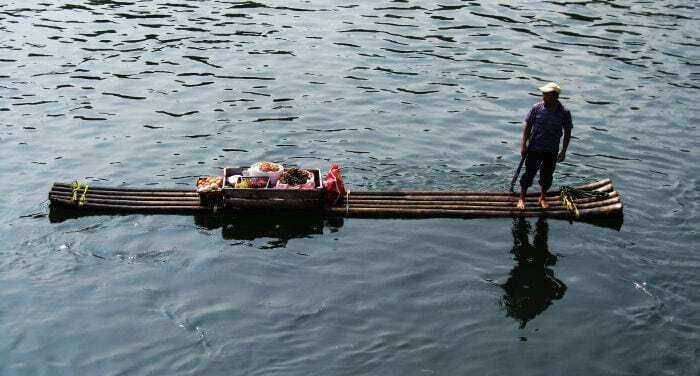 Although it’s constantly crowded during the entire year, it is during the summer period and main Chinese holidays (Chinese New Year and National Holiday) that it reaches its peak, transforming into an actual river of people. Both West Street and its neighboring areas, so rich with life, are worth a visit to try the street food and walk among a great variety of humanity. 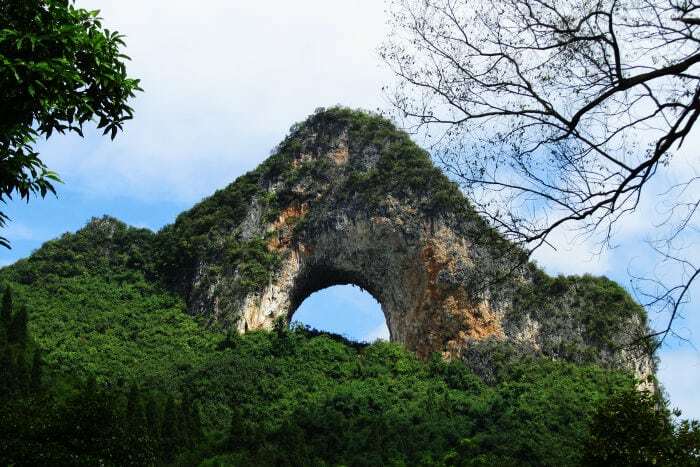 Among the varying karst formations that make up the characteristic nature of this area, Moon Hill is one of the most evocative. With its mule-shaped form and an enormous “hole” in its middle it is a unique structure of its kind. The hill can be visited all year long and starting from its foothills a path winds to the summit from which you can enjoy a stupendous view of the surrounding area. This is a majestic ficus tree of impressive size. It is in the middle of a lovely park, where there are also a few temples reachable by crossing a river by means of one of the bamboo boats typical of the area. It is certainly worth the 20 Yuan for an entrance ticket. About 10 kilometers from the city there is an ancient bridge (going back to the Ming epoch) still in use (only for foot traffic) that is visited for its typical architecture. The route you have to take to get there along the river is an integral part of its attractiveness because it winds through villages and fields which in Spring and towards the end of summer, offer a panorama flowering in a scene of various colors. This is a show held on the natural stage of the Li River. The show, directed by Zhang Yimou, who also directed the opening ceremonies for the Beijing Olympics, includes about 600 actors and, having the splendid karsts that dominate the area as a background and playing with the reflections on the river, it represents an attraction of notable interest. The karstic nature of the area lends to the presence of numerous caves of which many can be visited. Inside some of these you can take a dip or take a mud bath in natural hot springs. One of the most visited is Silver Cave, which has very large rooms, mud baths and stalactites and stalagmites illuminated in various colors. Around Yangshuo, at a distance that is comfortably covered by bicycle, in the course of a day you can find, in almost every direction, rural towns and villages (many of which are characterized by ancient buildings) where time seems to have stood still. The ones that I personally appreciated the most are Liu Gong and Jima, but the quantity and variety of these places reserve their best discoveries for those who love to explore and set off without a destination in mind halfway along any country road. Different but always very welcome is the atmosphere in clusters that are a little bigger like Xingping for example or Fuli Town, which are most certainly worth an entire day’s exploration. Click here to read our tourist guide dedicated to Yangshuo. To finish, here you’ll find our reviews on the best luxury and budget hotels in Yangshuo. First of all, health services in China require payment. For this reason we recommend that you take out a health insurance policy before leaving. The only health structure is the Yangshuo County People’s Hospital, 阳朔县人民医院, located at 28 Chengzhong Road. Don’t expect that in Chinese hospitals, unless its a private VIP hospital (which are much more expensive), that anyone will speak English or take care of you right away; you’ll have to wait on line and communicate in Chinese. But don’t be disheartened. After a first difficult encounter you’ll surely manage to work your way through the difficulties. The use of technology is a real help with communication since the doctor (usually a really young new graduate) will pull out their new generation Huawei, and via online translators will be able to communicate with you regardless of the language that you speak. Moreover, as underscored in other articles published on this website, the Chinese won’t expect that you speak their language, and when you speak it will even pretend not to understand you, so you’ll be guided and handled without having to speak. The core advice is to not rely on them completely and go to the hospital with a clear idea in mind of what you need done: a test, an X-ray, etc. In fact, since all services must be paid for, the risk is that the doctor will prescribe tests, check-ups and especially medicine in excess just to increase the final bill. The cost for a routine exam isn’t too prohibitive however: I paid 110 Yuan for an X-ray, while the blood test (which I declined since it seemed superfluous for an injury to my index finger), cost 50 Yuan. The medicine that I was eventually prescribed (nothing was broken) filled a whole basket for a cost of about 400 Yuan. After my selection, (I only chose the pain killer), that was reduced to a box for 30 Yuan. For more serious problems, I recommend that you go to an international clinic (in either Guilin or Guangzhou) where prices are much higher but the treatments and diagnosis are up to European standards. This is the reason why a health insurance policy is highly recommended. 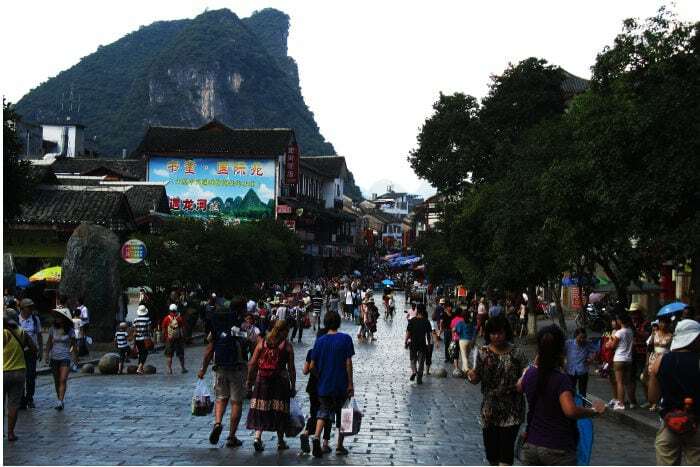 Considering the touristic nature of Yangshuo it is a great destination for those who love shopping. The vast majority of tourists are Chinese, and every good Chinese tourist wouldn’t consider it a vacation if they didn’t do some shopping. The dedication toward consumerism on the part of the average Chinese tourist has led to this relatively small town (compared to the size of other Chinese cities), which in 2015 received about 11 million tourists, developing a virtual infinity of rather large shops where it’s possible to buy everything. From cheap souvenirs to expensive designer brands, the varied range of products for sale will satisfy even the most demanding shoppers. Dresses of every sort, hats of every shape and size, backpacks, suitcases, trinkets, costume jewellery, gems and even notebooks and brushes, statues of various sizes and materials, masks, silk items, tea, to even drums and other musical instruments; every item that has a market, albeit a niche, has a place in one of the stores that fill both sides of West Street. Getting a “fair” price in a tourist town such as Yangshuo, requires some experience and patience; you shouldn’t be too greedy nor too loose with your money, you’ll need to always be ready to give up the item that you want and especially do so in a way that the seller doesn’t notice! The best thing to do is to find out ahead of time the actual cost and only pay that price. For more information on how to bargain with Chinese merchants, click here. Recently right in the middle of the city, at the beginning of West Street, a shopping area in Western style selling brand name clothing and other articles has opened. In these shops you can’t haggle (perhaps if you spend a lot there may be a little wiggle-room on the total) but they are surely meant for those who want want products of an expected quality. For most countries Guangxi Province falls under the jurisdiction of the consulate located in Guangzhou. Click here to learn more. There isn’t one in Yangshuo, since they are found only in the main cities. If you have to renew your visa or residence permit, you’ll have to go to another city. Once again, there isn’t one in Yangshuo, since they are found only in the main cities. In case you have to have a medical visit to get or renew your residence permit, you’ll have to go to another city. To register your address (the procedure is mandatory unless you live in a hotel), you’ll have to go to the Public Security Bureau of your region (ask for the address from your landlord or the agency that rented your the room/apartment).